Click here to visit Canadian War Brides on Facebook for up to date info on everything about War Brides! Click here to read Jackie Scott's story. Madeline Fitzgerald as a member of the Womens Land Army. 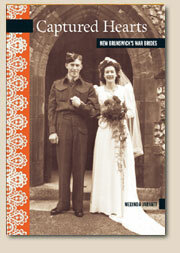 Madeline's story is in "Captured Hearts" New Brunswick's War Brides"
Joe Taylor on the day he received his citizenship, January 24, 2008. Welcome to the Canadian War Brides website. I hope you enjoy visiting this site and learning about the wonderful War Brides of World War Two! 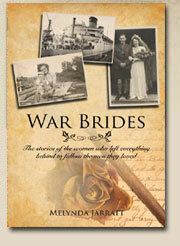 This is an independent website created by War Bride historian Melynda Jarratt for information purposes only. It does NOT represent any War Brides organization nor does it receive any funding. I am frequently asked about contacts in provincial war bride associations and about how to access passenger lists. I also receive many inquiries from young students researching Heritage Fair projects, to university students doing more in depth research on the War Bride story. I also help adopted children, family members and war children seeking their long lost Canadian War Bride mothers and or their veteran fathers from the Second World War. Please feel free to contact me at melynda@canadianwarbrides.com and I'll try my best to help you! 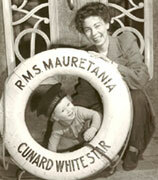 More news, articles and information about Canadian War Brides on my FACEBOOK site. Click here for larger image. 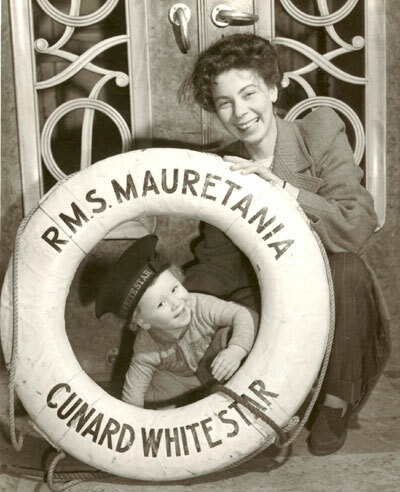 The late Helen (Grant) Hitchon and her son Alan on board the RMS Mauretania, February 5, 1946 as it departed from Liverpool.